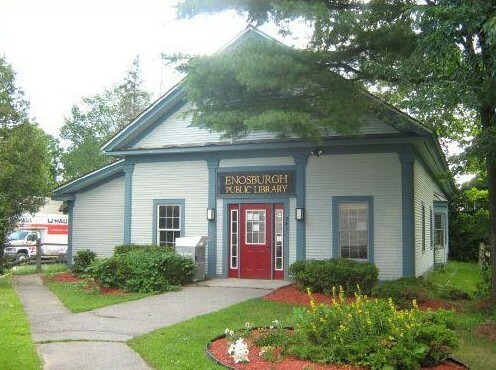 The Enosburgh Public Library is located at 241 Main Street in Enosburg Falls, Vermont. Its shelves are packed with 12,000 books, 450 audiobooks on CD, and over 2,000 DVDs. The library also subscribes to 30 magazines. The director of the library is Brenda Stanley. Brenda has the Certificate of Public Librarianship from the Vermont Department of Libraries and started on January 2016. The library lends out books, audio-books, DVDs, and we now have 18 pairs of snowshoes to lend. We provide free internet access through the use of our computers and WiFi for your laptops and devices. We are part of Listen Up! Vermont, through which you can download eBooks and audio books to your Kindles and other devices. The Library seeks to reach out to all residents of Enosburgh by being part of the Vermont Online Library (VOL) database, which may be accessed from residents’ homes. We also host discussion groups, children’s programs and more. Check the menu on the right for more information on these topics. The library is open to all, including seasonal residents and nonresidents. When signing up for a library card, please bring proof of your current mailing address, such as your license or a piece of mail. The Enosburgh Public Library meeting room is available to the public during regular library hours: Monday – Friday 10 a.m. – 8 p.m.; Saturday 10 a.m. – 4 p.m. In certain circumstances the librarian may agree to make the meeting room available outside of library hours, but this is entirely to the librarian’s discretion. The room should be reserved ahead of time to guarantee availability. Meeting room use is granted on a first come, first serve basis. Meetings held in the room must not be for profit. The meeting room door must remain open at all times. The meeting room table seats six comfortably. The room is not recommended for use by more than ten people at a time. Why is the name spelled Enosburgh Public Library? Enosburgh Public Library is owned by the Town of Enosburgh, although it is in the Village of Enosburg Falls. Although the building was designed to look old so as to blend in with the other buildings in the village, it was only built in 1983. Why is the building out in back? The building is set back behind the town clerk’s office because this parcel of land was donated to the town. Who is the boss of the library? Townspeople elect trustees at town meeting. The trustees are responsible for keeping the library running and for writing policies or rules for library operation. The trustees hire the library director, who is in charge of the day-to-day operation of the library and for enforcing the policies. Brenda Stanley is the library director. She has the Certificate of Public Librarianship from the Vermont Department of Libraries and started on January 2016. What happens at the librarian’s desk? If you do not have a library card, you can get one from the person on duty at the desk. You can ask reference questions, find out the times the library is open, and check out books at the desk. In order to use the computers you must sign in at the desk. Does the library have a card catalog? The library has an online catalog where you can search for books by title, author, keyword, and more. The librarian on duty can show you how to use this catalog if you’re not sure. The library also has a physical card catalog, but it is no longer being updated, and hasn’t been since late 2011.
Who may use the computers? People over age 18; people under 18 with their parents’ written permission. May we print information off the computers? The printer prints black and white only. Copies cost 10 cents. The library also has a photocopier. These copies are 15 cents apiece. For those making copies for school or tax purposes, the first 15 copies are free. How long may we keep a borrowed book? The loan period is 2 weeks. You may renew the book for 2 more weeks. What if you don’t have the book I want? We will attempt to borrow the book from another library. This is called interlibrary loan. Does the library loan videos? Yes. The library has a collection of both DVD and VHS movies available for loan. Movies only circulate for one week at a time, and you can’t take out more than two at once. Does the library have audiobooks? Yes. The library has a collection of both CD and cassette audiobooks, which circulate for one week at a time. Does the library have ‘talking books’ for people with vision problems? We don’t have them in the collection, but we have paperwork to get you signed up through the VT Department of Libraries Special Services Unit. The books are then mailed directly to your home. Does the library get a daily newspaper? Yes. We get the St. Albans Messenger. We also subscribe to the weekly County Courier. Does the library loan magazines? Yes. We have quite a good selection of magazines including: Smithsonian, National Geographic, Time, Good Housekeeping, Country Living, Woman’s Day, and Consumer Reports to name a few. For children we have Ranger Rick and Highlights for Children. The library also has copies of the town and school reports. Does the library keep new books separate? Yes, new books are found on the book shelf labeled New Books. Fiction is not a true story and is written for entertainment only. Nonfiction is true and is for entertainment as well as enlightenment. Nonfiction is typically used for learning for school reports or for adults trying to educate themselves. Nonfiction is shelved by numbers that correspond with the subject of the book. Biographies have their own section and are nonfiction. Books are divided the same way in both the children’s and adults sections of the library. The library has two revolving paperback racks full of paperback books that are mostly donated to the library. These paperbacks are not catalogued: they are signed out by hand and are not found in the online catalog. Are there other special collections? We have a section of science fiction collection, and a bookcase of reference books. We have a Vermont books section and this includes rosters of veterans from our areas who served in the wars. We have a section for craft books, one for graphic novels, and a section for books and videos about parenting. If you live in Enosburgh and pay taxes in Enosburgh, YOU DO!! !